It all began only a month ago. I had been thinking about how I will be getting around our campus here at the University of Arizona since they will be restricting parking yet again to a mile radius. Then I thought of it one day as I sat at a restauraunt overlooking a street, and a bicycle with a "helper" motor drove by. I should get a moped. So that night I began crusing the internet looking for mopeds. There seamed to be plenty in other states especialy CA and back east, but nothing at all in Arizona. So I began to inquire about shipping and found out just how much it would cost to ship a 90 pound moped. Forget it. A few weeks went by with nothing else, then I remembered something. When I was about 12 a friend of the family had a son who collected old bicycles and I recall two were mopeds. So I looked his name up in the book, and left a message with him. The Sat he returned my call and told me he had two mopeds that needed a little fixing up. So I told him I would be out later that day to see them. When I got there he led me to an enclosed car hauler where he had them stored. There they were covered with dusty tarps. 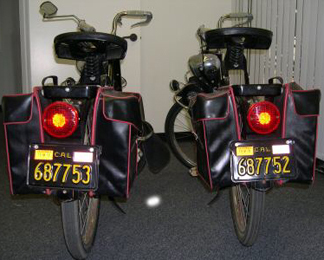 Two Solex mopeds from the mid 60's. One was missing the light, and the other looked very complete. I asked him how much for the two. He quoted me a price of $250 (which was about how much it cost to ship a moped from NewYork). So we shook hands on the deal, and I picked them up a week later. When I got them home, one had a flat tire, but the other's stayed filled with air. So I pedeled and finaly got it to start. It wasnt very powerful at all. Undaunted me and my boyfriend began to tear it apart. He cleaned the gas lines, and fuel pump, and tightened all the bolts on the engine which most were loose. Then he got on and started it, and it took off with an amazing burst of speed. The next day we went to WalMart and bought a digital bike spedometer and hooked it up. It went an amazing 15.5 mph. Then I set to work on the other moped. The fuel pump proved to not be working, and the gas tank was too coroded to survive a "presureising" technique I tried to clean it out. So I am awaiting parts for it. 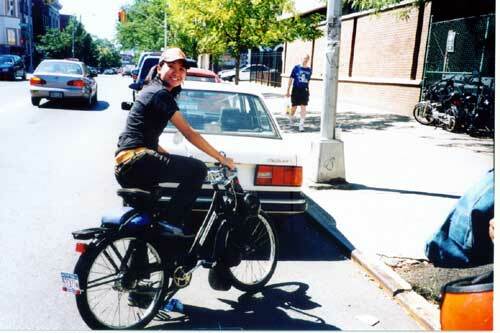 that day I have been riding the black Solex around the neighborhood. I get smiles and stares from people and a lot ask me where I can get one. The best is when someone asks me if I want to sell it, and I can pridefully say no. I was also able to "tune in" the carb and got it to whizz along at an amazing 18 mph, and got it to speed up to 19.5 downhill. 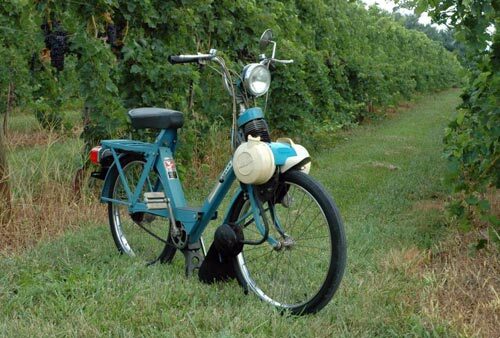 All I have to say is that a Solex is a wonderful little machine. It may not have a ton of power for hills, but it really is amazing what the little 2/3 hp engine can do. I even found out that they are being reproduced as they were when production ended in the late 70's and that parts are very easy to come by. Not only that but the price is very reasonable. I know that me and my boyfriend never parting with our little Solexes, and with luck I will get the other running in a week. Durant les années 70 la societé "National Inventors" a aussi importé des modèles 3800 et 5000 comme le prouve ces photos. 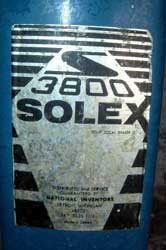 During the Seventies, "National Inventors" imported models 3800 and 5000 as can be seen in these photos. I can tell you a little about what I remember of the National Inventors Society. It was owned by a man named Mr. Neal; I don’t know his first name. My first two Solex bikes came from his downtown Detroit warehouse. His building was in a run-down part of the city because he got cheap rent. The parts of the bikes came over from France all in pieces, even the rim spokes. He had them assembled by a crew of about four people. One of his top people was a man from Tennessee named Eddie. About all he could write was “Paid Eddie” on the invoice in a very scribbled handwriting. Mr. Neal was very high in the Republican Party of the 1970s. I found Mr. Neal to be one of the finest people I ever met. First with my brother Gary, who had bought a Solex bike from a car rental shop in downtown Birmingham, Michigan, so that he could have an easier time on his newspaper route delivering the Detroit News. 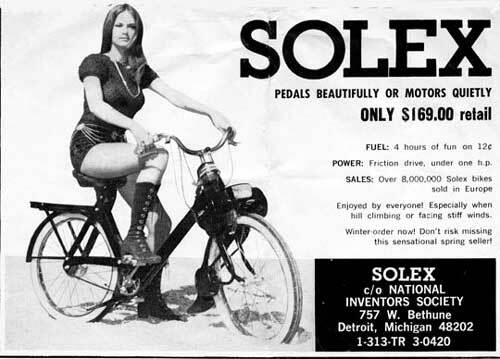 My brother wanted this Solex bike real bad. It was in a display window in front of the building. The only problem was that the plastic gas tank had a leak. The owner of the car rental shop said that he would fix the leaking gas tank with epoxy glue, and, if it started to leak again, that he would replace the tank. The repair did not work, and when the Solex bike was brought back to him by my mother and brother, the owner of the shop was out in the lot vacuuming a car. When they brought the Solex bike up to him, he looked at my mother and brother and did not stop to talk to them, hoping they would go away. When they did not, he finally turned off the vacuum cleaner and said to go talk to the distributor of the Solex bike about the problem. He gave my mother the name and phone number of Mr. Neal, and while my mother was still talking to him, he turned the vacuum cleaner back on, cutting her off. This was the first time I saw an adult be rude to my mother. 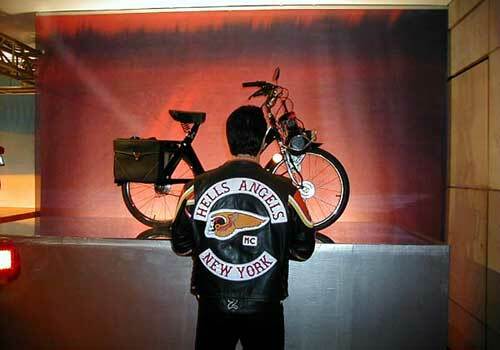 My mother contacted Mr. Neal about the problem, and he was so mad that his Solex bike was represented in this manner that he sent Eddie out to pick up the bike and bring it back to the warehouse. Mr. Neal replaced the gas tank free of charge and had Eddie drive the Solex bike back to our house. 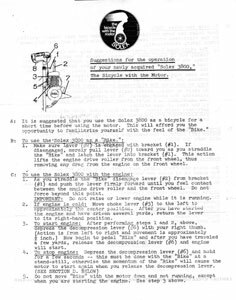 Mr. Neal told my mother that if the Solex bike had any other problems, to let him know and he would take care of them, even though he was a wholesale distributor. 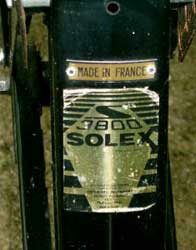 Mr. Neal was very honored that my brother was using his Solex bike for a business purpose. My personal experience with Mr. Neal was just as good as my brother’s. The year was 1973. I rode my Solex bike with my best friend Martin on the back luggage rack to an antique flea market. Not being wise, I did not lock my Solex bike with the attached front wheel lock. When we came out of the store, the bike was gone, with only signs of tire water marks on the sidewalk. 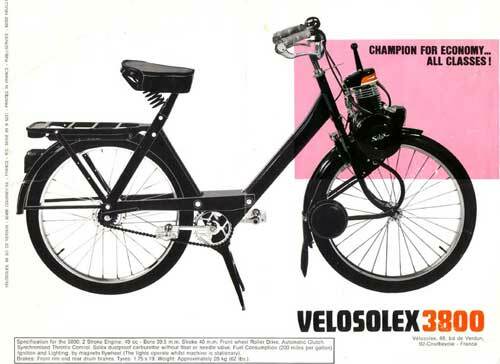 I thought to myself that with Mr. Neal being the fine person he is, that he would probably feel bad for me and sell me a new Solex bike at cost. He did ! Mr. Neal’s crew did all our decarbonizations for us. My father would drive us to his warehouse at 757 West Bethune Street. He would beep his horn so that Mr. Neal’s people would open up a metal folding door. 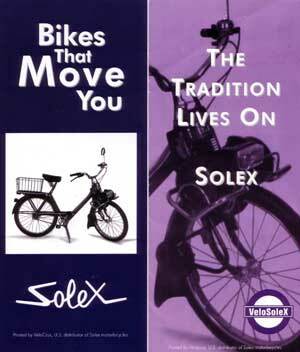 I can remember seeing about a hundred assembled S 3800 model Solex bikes, ready to be sent out to local bike shops. I can remember seeing a mountain of rim spokes on the floor, and a woman in the office who did the paper work. 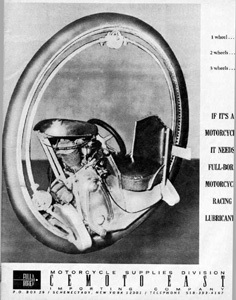 Mr. Neal’s trademark was the black and gold sticker that was put below the seat that had the name “National Inventors Society” along with his address and phone number. I would love the Solex community to know what a fine person Mr. Neal was. He loved kids and deserves recognition for the service he provided Solex bike lovers. 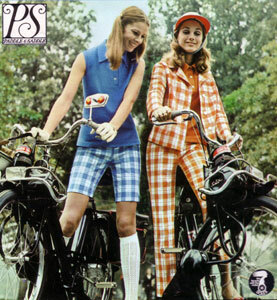 "SOLEX the bicycle with the motor"
So start wheeling'n feeling groovy with the wheelgirl wardrobe and bicycle built for you ! Paddle & Saddle's new placesetters are fashioned for freedom and fit in dashing padal-plaids of 100% cotton treated with Du Pont Ze Pel * stain repeller. Styled to catch the girl watcher's eye when you whip by on your shiny Solex - the fabulous new bicycle from Paris you can ride two ways. Forget the motor ; you've got one of the world's great bicycles. Engage the motor and you really go places - at a safe'n steady 19 mph!
" 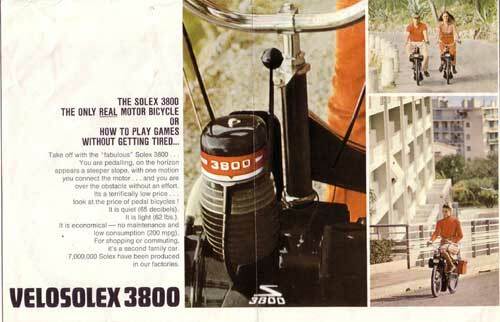 Seventeen - April 1968 "
SOLEX 3800 CHAMPION FOR ECONOMY...ALL CLASSES ! THE MOTORISED BIKE SHOP N.J.
Dans le film " les 3 jours du condor " réalisé en 1975 par Sydney Pollack l'on peut voir Robert Redford sur un Solex 3800 dans les rues de New-York. 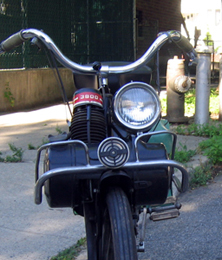 In the movie " 3 Days of the Condor " directed in 1975 by Sydney Pollack, Robert Redford can be seen riding a Solex 3800 in the New York streets. 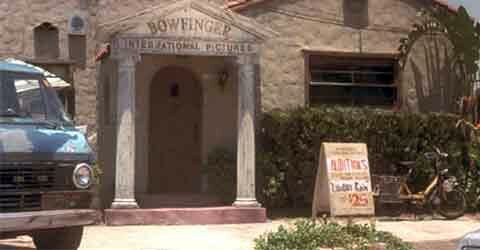 Dans le film " Bowfinger " réalisé en 1999 par Frank Oz l'on peut voir un Solex 5000 jaune devant la maison de Steve Martin à Los Angeles. In the movie " Bowfinger " directed in 1999 by Frank OZ, a yellow Solex 5000 can be seen in front of Steve Martin's house in Los Angeles. Dans le film " Charlie et la chocolaterie " réalisé en 2004 par Tim Burton l'on peut voir plusieurs Solex très particuliers. 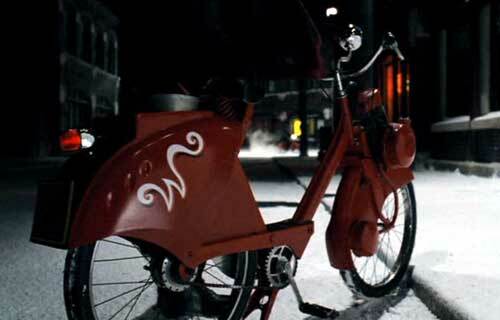 In the movie " Charly and the chocolate factory " directed in 2004 by Tim Burton , several special Solex can be seen. IF IT IS A MOTORCYCLE, IT NEEDS MOTORCYCLE RACING LUBRICANTS ! - manufacturer of special motorcycle racing equipment, specializing in lubricants. 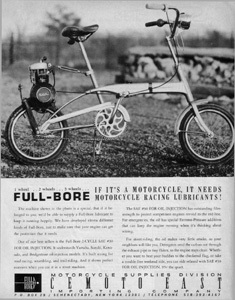 Eleven different kinds of Full-Bore lubricants were available, so that your engine was sure to get the protection it needed, even if it was unusual, like a SoleX engine mounted on a bicycle, as shown in this advertisement from 1967. - fabricant d'équipement de motos de courses, spécialisé en lubrifiants. Onze sortes de lubrifiants Full-Bore étaient disponibles, aussi votre engin était sur d'avoir la protection dont il avait besoin même un engin peu commun, comme un moteur de Solex monté sur une bicyclette, comme le montre cette publicité datant de 1967.